Have you noticed how the sun sets each day, painting the sky red and purple before it drops behind the Albères? That moment, as the light sets the earth afire, Thomas Verny records in quick pastel sketches. His series of small pastels are the inspiration for large vinyl and acrylic canvases. Both are on display at the Musée d’art Moderne of Collioure in an exhibition called “Atelier 2010-2011”. In the works, created during Verny’s residency in Collioure, he plays freely with the duality of sea and mountain. Working outdoors, he translates his impressions into spontaneous views. The medium of pastel lends itself to a deft treatment of detail. Here light is all. In his land-and-sea-scapes, Verny often wraps the material world in shadow. Familiar sites become mysterious: a block of flats condensed into a series of noughts and crosses, a snowcapped summit screened by palm tree trunks like spiky bars from hell. Restrained touches of red or orange intensify the scene. 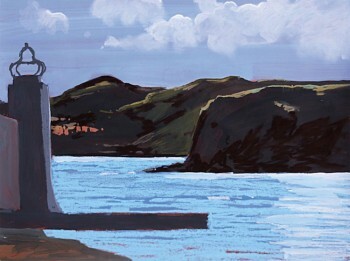 With colour he creates sharp contrasts between foreground and background. Hillsides become green brushed velvet or army camouflage. Verny applies his paint in quick and energetic brush strokes, like a man hurrying down from a day’s walk in the mountains before the light gives out. Forts, farmhouses and chateaux are silhouetted under an orange and pink sky. The overall impression is haunting. Now you see it, now you don’t – the light changes everything. The Musée d’art Moderne of Collioure is showing the works of Thomas Verny until the 29 February 2012. Seize the opportunity!